Marlyn Diaz » Blog Archive » the power of food - eat better, age younger. During the last year I’ve seen miracles happen! LOTS of women and men in their mid years who were stuck, ready to make some changes and were having a tough time getting there on their own. When we hit 40, 50, and 60 our bodies are going through BIG time changes. For many high blood sugar, cholesterol, and blood pressure challenges begin to happen and for others it’s weight gain, fatigue and trouble sleeping. Today I’d like to bring the conversation back to the HEALING POWER OF FOOD. The simple act of eating real food that is alive with life force and energy is one of the most powerful things that helps my dear clients like Ilene (see her story below) change their health and their weight for the better. “What you eat you become.” – So when you are choosing your next bite – ask yourself, “Do I want to be made up of this highly energetic apple, peach, pear or veggie? OR this chemical-laden processed diet coke, Oreo, wheat cracker or fill in the blank!” I know it tastes great, though what is it doing to your cells? Aging you FASTER! When you begin to clean up the chemicals, additives and SUGAR and add in more plants, veggies, and fruits you will feel better and age younger. Food is information – It tells your cells to turn things ON and turn things OFF. We want to turn on the good stuff (immunity, energy, hormone balance) and turn off the bad (inflammation, bloat, weight gain!) Aim for clean, whole, and organic where possible. READ LABELS – Avoid ingredients that are difficult to pronounce or your that your grandmother wouldn’t recognize. Most likely these are made in a lab and are used as fillers and shelf stabilizers. Keep in mind too that big food companies are looking out for profits, not your health. Take your power back today and become your OWN health advocate! 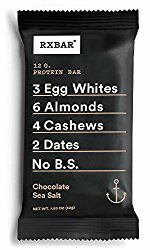 A NEW FUN FIND: RX BAR – simple, tasty and delicious. Easy for travel. Spring is a great time to start looking at your life – what’s working and what’s no longer serving you. Begin this season by bringing in one new healthy habit. And if you need some extra support reach out, I’m here to help! This entry was posted on Sunday, May 7th, 2017 at 7:06 am	and is filed under nutrition. You can follow any responses to this entry through the RSS 2.0 feed. Both comments and pings are currently closed.